Bavarian Bier Cafe, Eagle Street Pier, Brisbane CBD - my name is Food. 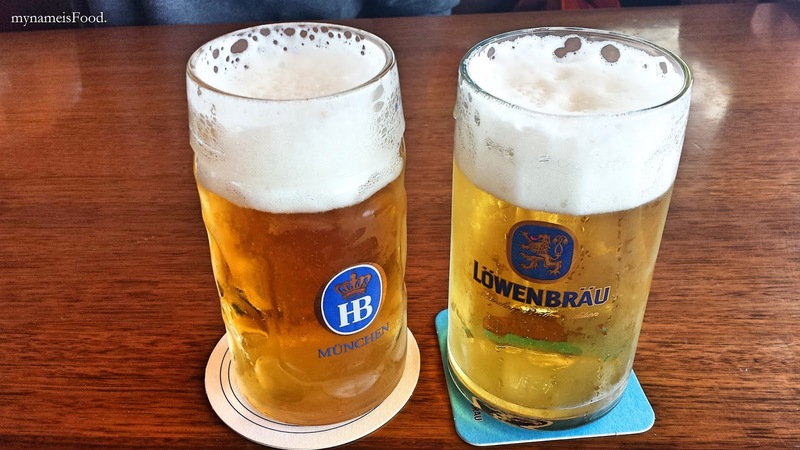 I would have to say that Bavarian Bier does a kick in serving classic German dishes, big portions, beers ranging from 300ml - 1 litre, fabulous views, the Story Bridge lighting up at night as a backdrop, fresh air, comfortable seatings may it be at the bar or a more booth feeling or maybe a date night, whatever it is, just remember to come in with a not-so-full tummy since I assure you, by the time you leave, your tummy will be filled right to satisfaction. Located above Grill'd, opposite Pony and next to Sake, it definitely had its spot with occupying a very big space in the upper level of the precinct. As you enter the restaurant, you are greeted by large elk's head mounted on a wooden panel with chalked specials or beer menu underneath them. Their large dining areas comprises of a variety of seating which can occupy corporate functions, friends gathering, after-work drinks, bar drinks, birthday parties and so on. Let's just say that they have made the atmosphere welcoming to anyone and everyone. 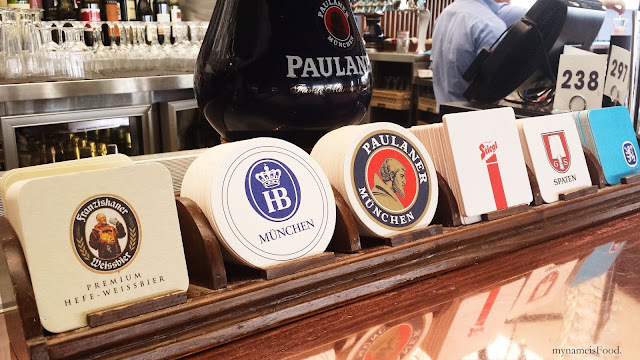 Offering a wide variety of German bier, I sure felt as if I was in Beer Heaven. 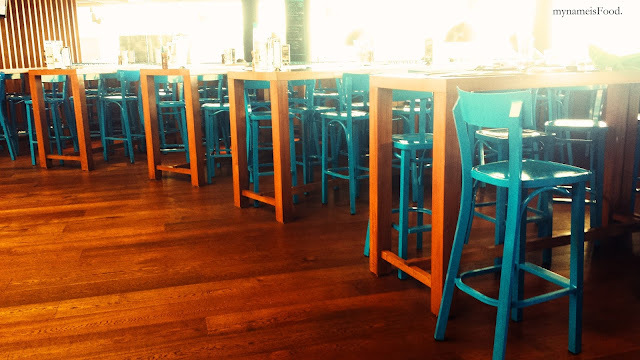 Bar seatings are available right infront of the bar. Tends to get packed especially during Friday and Saturday nights. We bought two different types of beers in 500ml each which were the Hofbräu Original, a refreshing, bitter but light beer and Löwenbräu Original, a crisp, complex and refreshing beer. 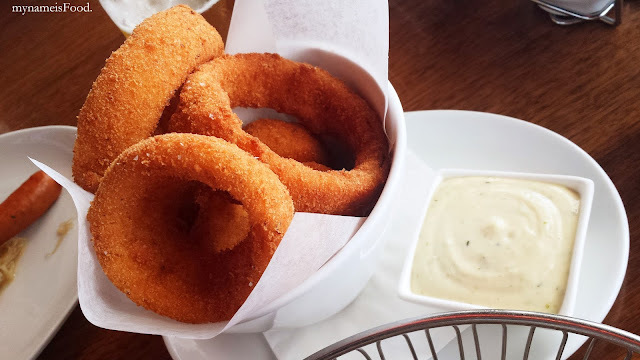 I guess I got you drooling over the scrumptious, mouth watering, crispy, homey food didn't I? 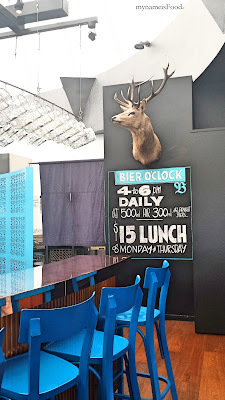 I have dined here a few times but did not really take much good photos really, hence why this post may be late or old but I thought I would share my experiences and thoughts with you. 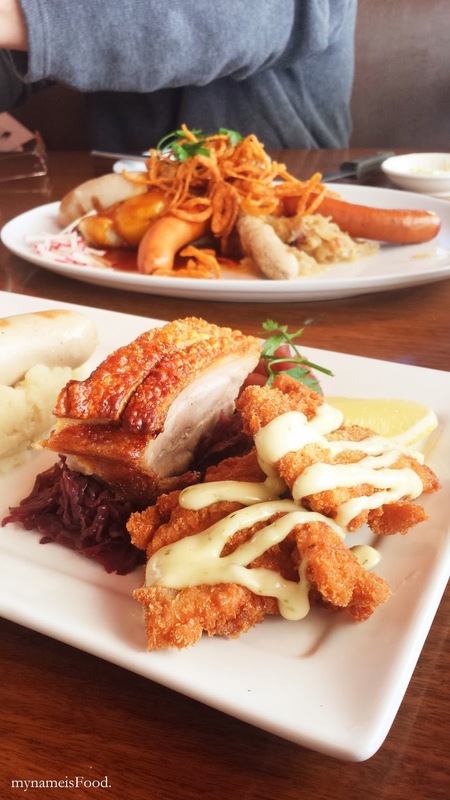 I am not foreign to German or European cuisine, growing up with German influences through my parents has allowed me to taste and be familiar to German food since young. From Pretzel to Pumpernickel (a dark sweet rye bread), from Crispy crackling pork belly to Pork Knuckle, from Apfelstrudel (Apple Strudel) to Schwarzwalder Kirschtorte (Blackforest Cherry Cake), from Lebkuchen (similar to gingerbread but has a sugary or chocolate coating) to Stollen (dried fruit cake filled with marzipan and fuits eaten during the Christmas period)... and the list can go on. 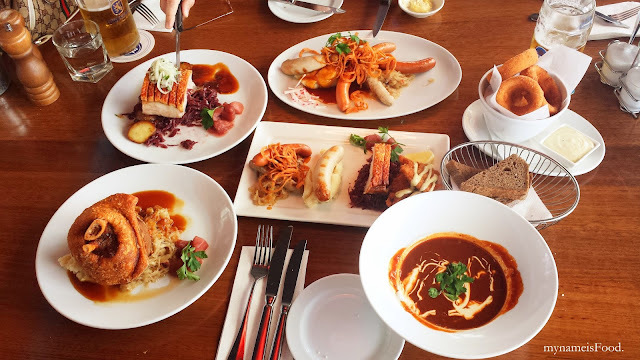 I don't think I have ever gotten bored of eating European food despite I have an asian background. I am thankful to them to have introduced me to such different cultures since I was born. Well, let's start with the food shall we? 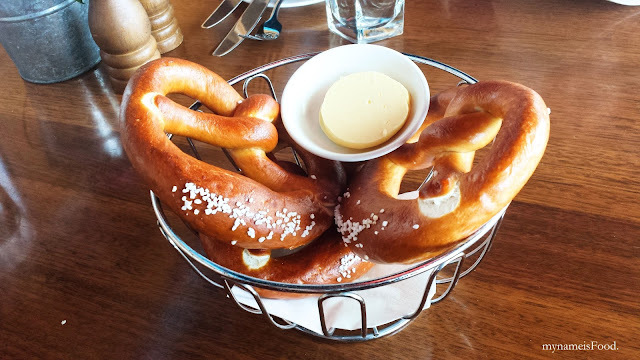 Starting off with 'Haus-made Bavarian Pretzels' with butter ($4.5) as a starter is definitely a must for me when I go to any German or Bavarian restaurant. Why? 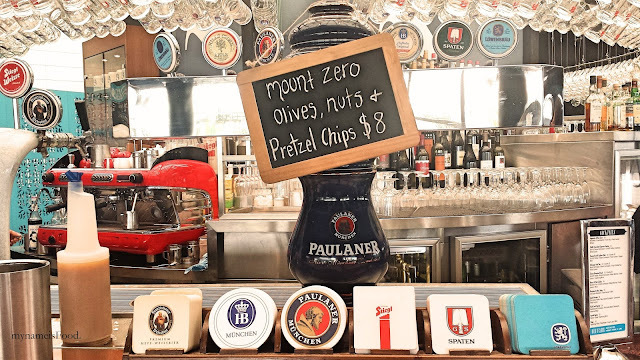 Because it shows alot for me when a restaurant can make a good pretzel or not, I have been to places serving dry, crusty, cold or even bready pretzel, so a good pretzel gives the whole night a good start. These pretzels were warm and had the right texture in and out, the softened butter also helped with the taste as you eat it. 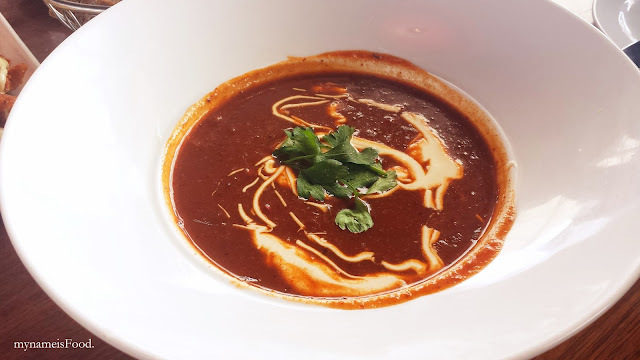 'Klause' Gulaschsuppe' ($14) is a Spicy Beef Goulash Soup served with grilled rye bread. Plated in a big bowl plate, touched with a dash of cream made the dish prettier than it should have been. The soup reminded me of a beef and vegetable stew in which I was told by my dad whom have lived in Europe for a long time that Goulash was served during the hard times back in the centuries, when it was cold and people was struggling with food. Some says it is the food for the prisoners back in the days, using old and leftover meats available, and what kept them warm through the cold night was the soup and slices of bread, an inexpensive peasant stew. 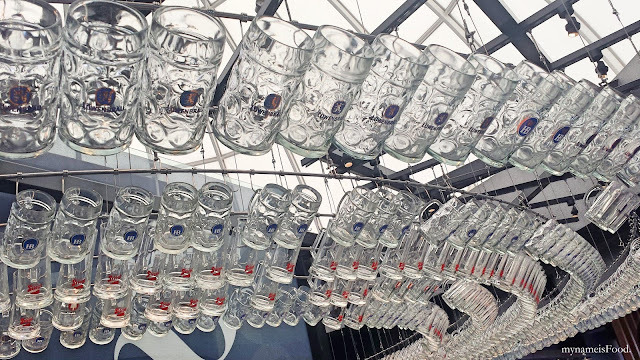 Though some also say that they are thick soup made by stockmen and cattle herders. I found that the taste had a distinct smell of paprika, which is one of the main spices used but other than that, the soup was just a stew, a nice soup to warm you up during winter's night. 'Onion Rings' was thick and nicely crumbed, very crispy and was an ideal side against all the meat dishes that we had on the way. 'Crackling Pork Belly' ($29) served on a bed of braised red cabbage, roasted potatoes, onion, Bier jus and Granny Smith Apple compote. What a combination but it all worked nicely with each other. The elements of each condiments complemented the other perfectly. The pork belly was carved well, a decent portion with thick juicy meat (of course there are fats in it but it did not overpower or over-portion the meat) and its skin, salty and crunchy, just a delight to the eye and to the tongue of course. 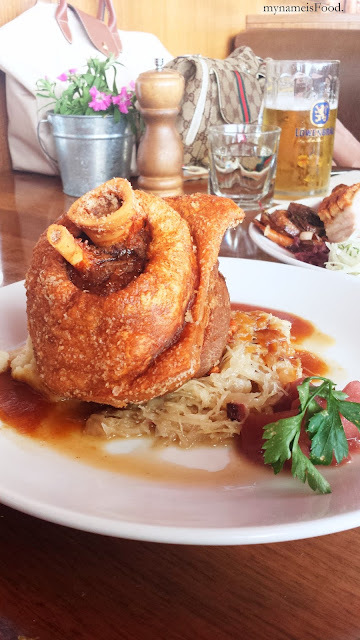 The crackling was the highlight and it did not dissapoint, off the meat easily and was not hard to bite through. 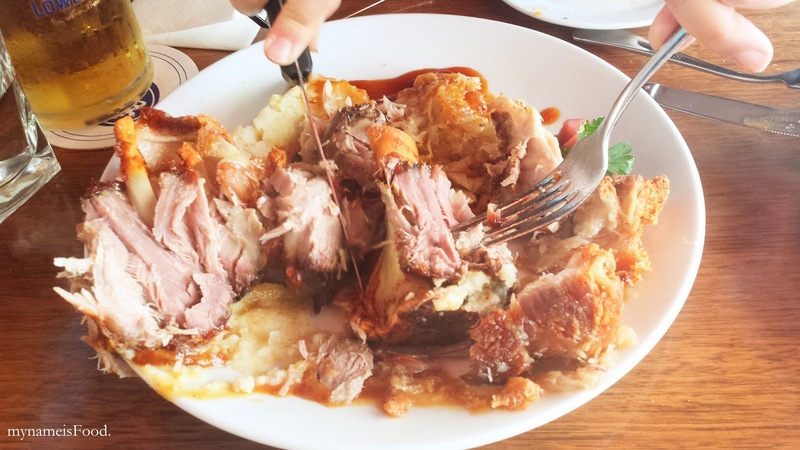 I have had a few pork bellies where the crackling was really hard to bite through hurting your teeth in the end, and even trying to slice it with your knife seemed hard. 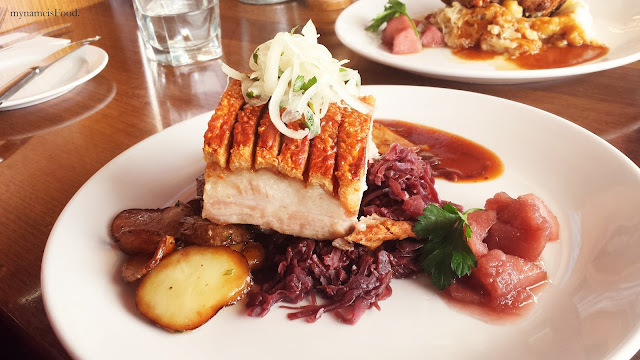 The braised red cabbage, sauteed potatoes, onions and bier jus was well thought out with the touch of the Granny Smith Apple compote's sweetness yet sourness made the dish an exciting dish to finish with different flavours allowing the pork belly to be accompanied by. 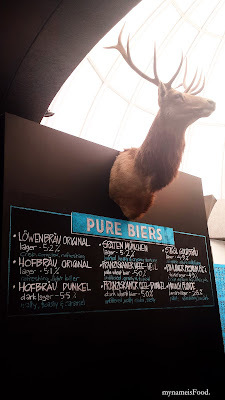 I would have liked to have more bier jus though since I tend to put roll my meat on the sauce before biting into it. 'The Famous Crispy Pork Knuckle' (Half; $27, Whole; $34) served on creamy mash, Sauerkraut, Bier Jus and Granny Smith Apple Compote. 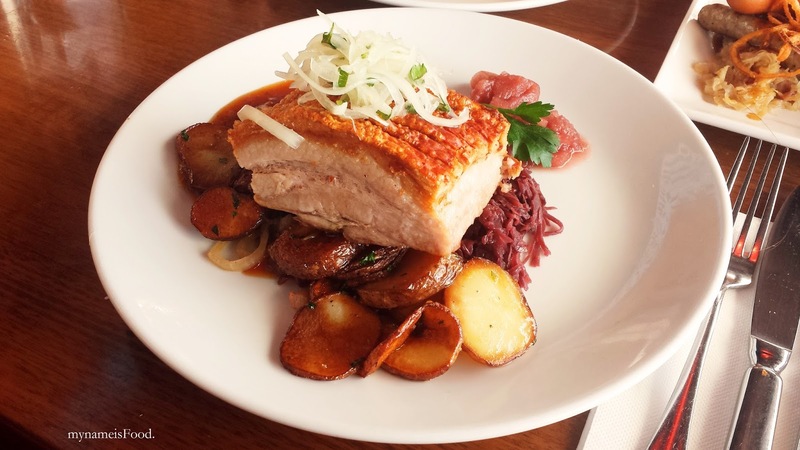 May I say, OH MY PORK, what makes thou so beautiful?.. I could just look at it for hours but no, it isn't a good idea because it will get cold, then you won't eat it and your drools will go unnoticed. 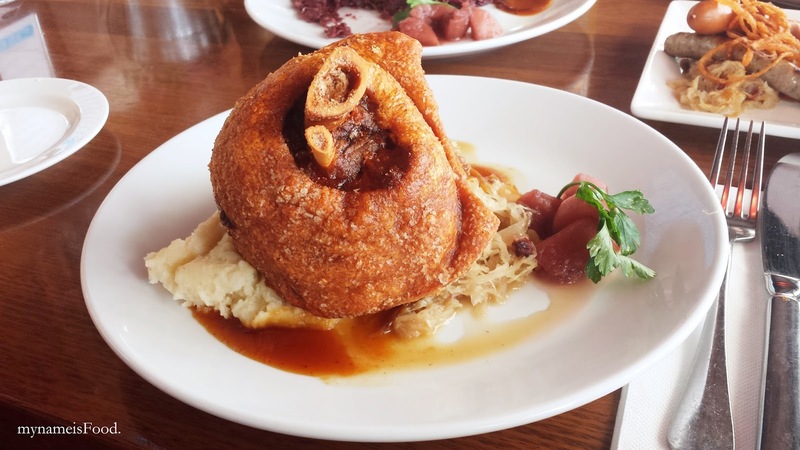 When the highlight of the dish is the Pork Knuckle itself, then make it that way. Right? They did it right, again.. A very decent portion of whole size pork knuckle came onto our table, plate still warm, the creamy mash, the sauerkraut, the bier jus (though again, it would have been good if there were more jus) complemented the pork well, it was a nice touch with the compote yet again giving it that subtle sour but sweet coldness to the dish. A nice quick getaway from the pork feeling, the pork taste of the dish. 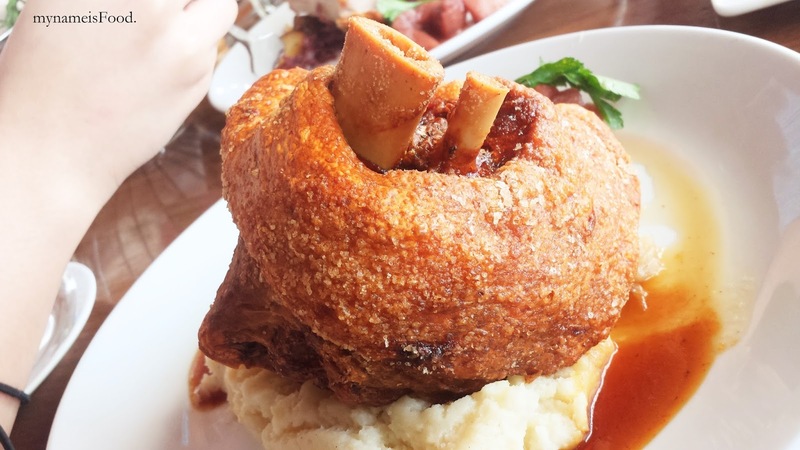 The creamy mash lacked the taste of the salt but it didn't matter since the pork knuckle's flavour was rich and strong, the armour of pork crackling delivered a big drooling mouthwatering crunch. You could even pick the whole pork knuckle up by the end of the bone. The crackling though well seasoned and it had no lack of crunchiness, it did make some of the meat beneath it quite dry.. another reason why it would have been good if there were more bier jus on the plate, or even a little jug of self-serving bier jus could have sufficed. Well spent on our bucks I have to say on this one, a definite must try other than the Pork Belly. Everything you want to try is on the plate, so now, where do you start? 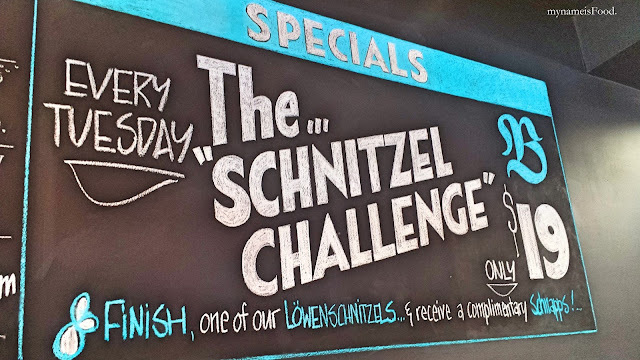 The Schnitzel maybe? The sausages? 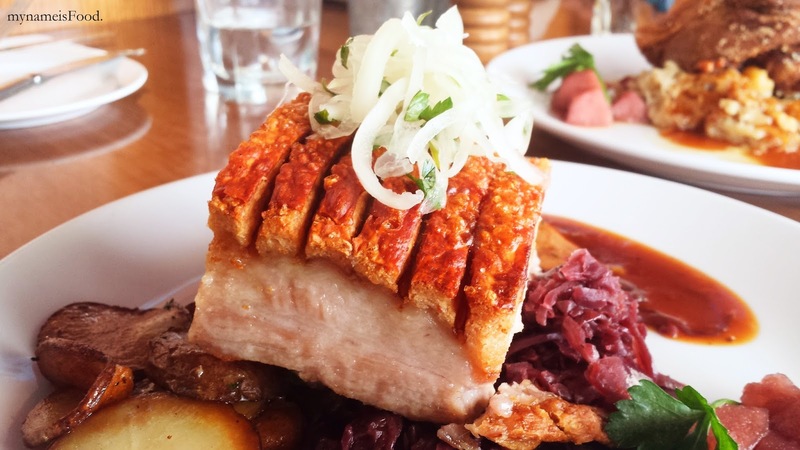 Oh how about that pork belly staring right at you? 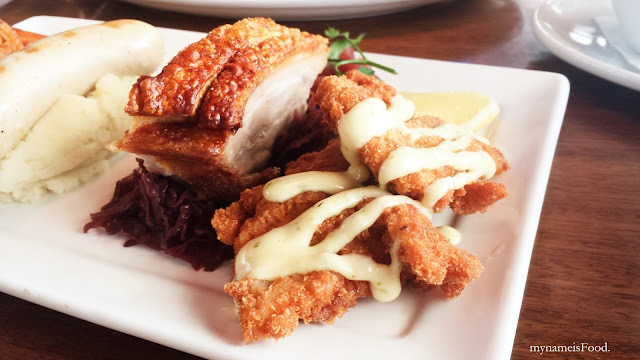 The Schnitzel with a squeeze of lemon was a nice addition to the pork-filled-platter, crunchy on the outside, cooked nicely inside. 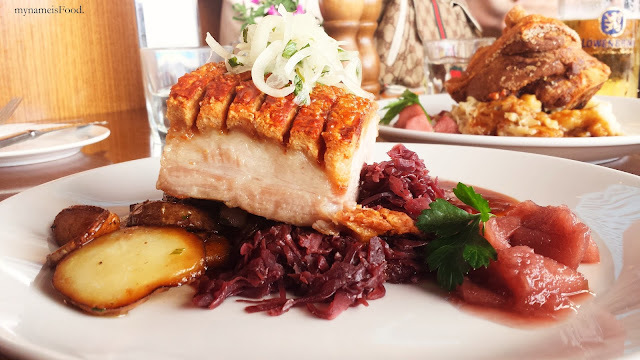 The crispy pork belly, well, you know what I think of it from above, juicy, succulent, crispy crackling and the braised red cabbage was good to let go of the pork taste for a bit before digging into the Haus made sausages. 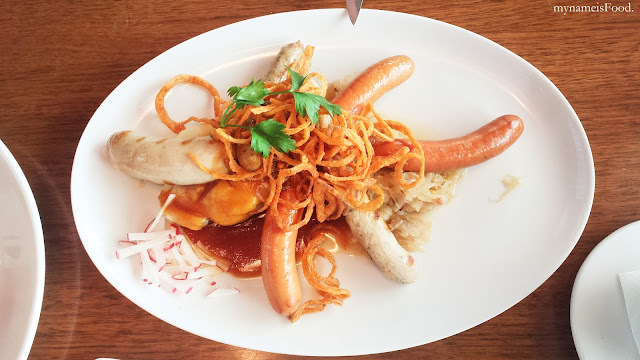 The three Haus made sausages given in the platter were the Swiss Bratwurst, Grilled Nurnberger and a Frankfurter. All three were rich and full of flavour. The crispy onions was something different, you don't usually see them do onions like these. 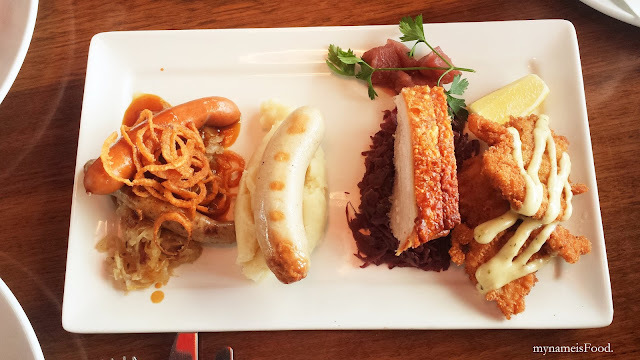 I felt that the Haus made sausages made it the lightest out of the three meats on the platter and I enjoyed them fully. 'German Sausage Tasting Platter' ($27) includes Grilled Nurnberger, Swiss Bratwurst, Cheese Kransky, Chilli-Spiced Debreziner, Frankfurter on a bed of creamy mash, sauerkraut and bier jus. 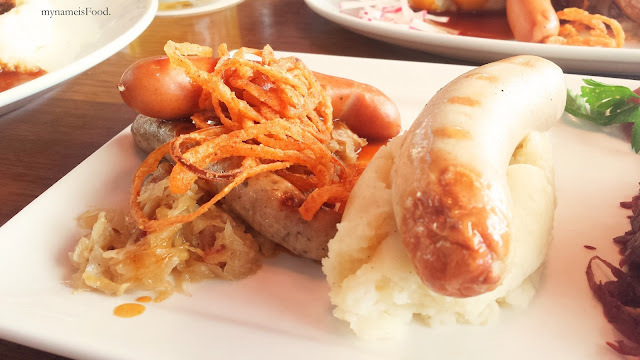 I have enjoyed German sausages from young till now and I have to say, I do not, I never get bored of them. May they be on a creamy mash or even in a bread roll, or by itself, I do not mind really. 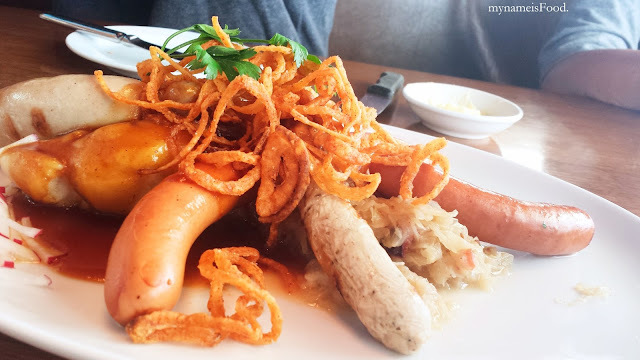 A plate full of different types of Haus-made sausages, all rich and full of flavour yet again, however it does get cold quickly. Their soft texture but gentle and smooth skin quite makes some of them delicate though some may be more densed than the other. 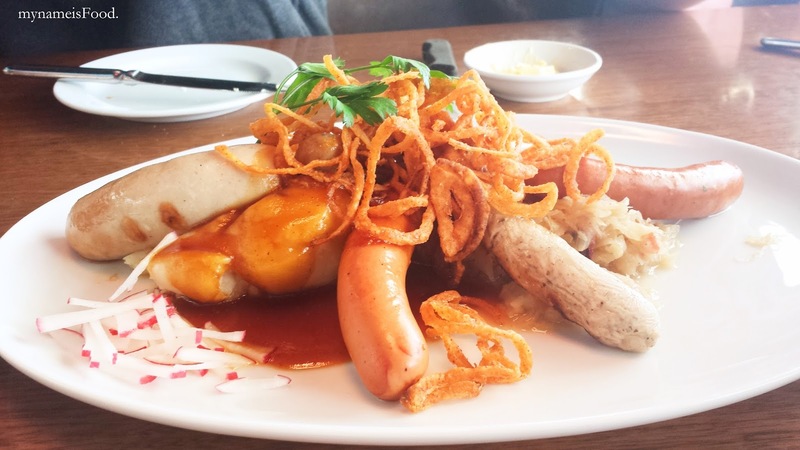 The crispy onions and the creamy mash was the perfect side to go along with the sausages and accompanied them well. 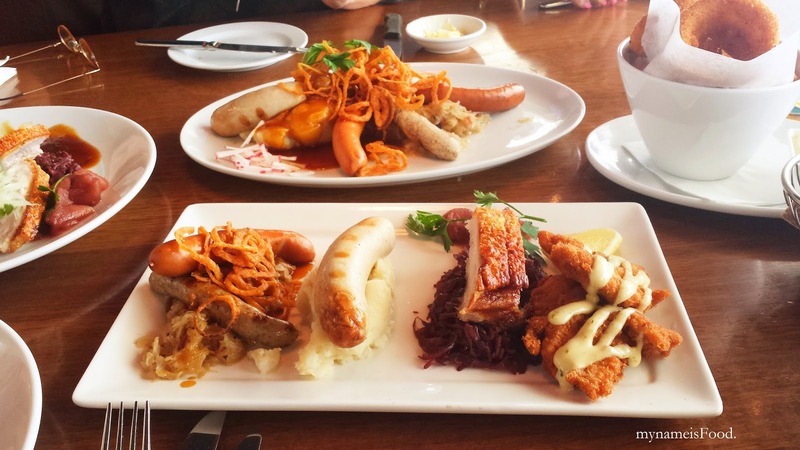 My favourites of the sausages must have been the Grilled Nurnberger, Cheese Kransky and the Swiss Bratwurst but overall, I enjoyed them all. 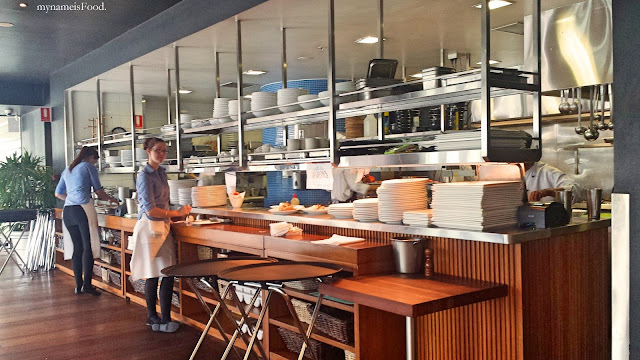 Remember to book for Friday and Saturday nights as it might get busy then, if not, just walk in and one of the FOH will help you find a seat. Oh, and come with a growling tummy because you definitely need a big appetite to be able to pork it out.